Chenin and Sean Carlton - Twist Wine Company-Unpompous Wines! The family that labels together sticks together! Vincenzo, Audrey, and Chenin Cilurzo in their Chenin Blanc vineyard. Summer, 1969. Chenin Carlton was raised in Temecula California. 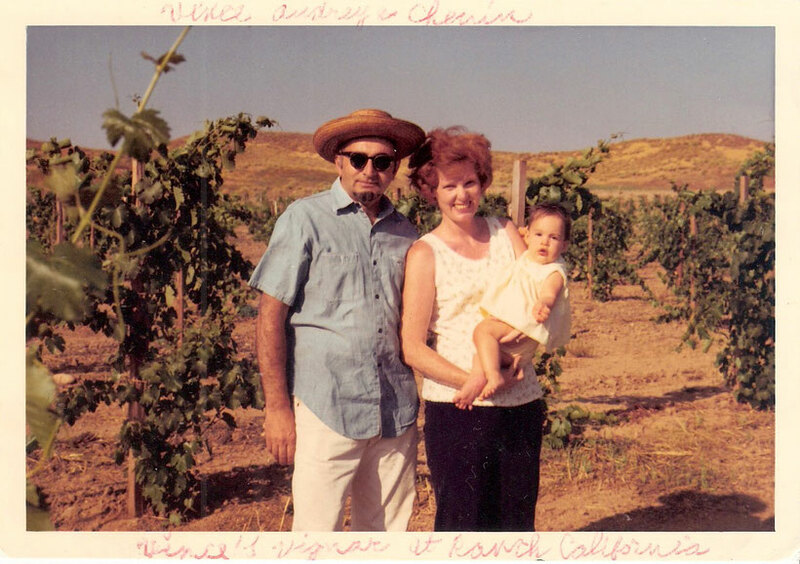 Her parents planted the first vineyard in the Temecula Valley. After spending a year in France learning the language, she moved to the Napa Valley in 1992 and started working for Domaine Chandon Winery. In 1996 she began working for Pine Ridge Winery, where she met her future husband Sean. From 1997-2001 she worked for Groth Vineyards and Winery. After moving to Oregon in 2001, she had stints at Cristom Vineyards and Lange Estate Winery. Sean Carlton grew up in Colorado, and moved to Santa Barbara, California in 1989 for college. Majoring in Microbiology, Sean fell in love with wine in the Santa Inez Valley. In 1994 He moved to the Napa Valley to work for Pine Ridge Winery. In 2001, Sean transferred to Pine Ridge's sister winery in Oregon to become Vice President of Operations. In early 2006, after nearly ten years of development, we started our own wine company. Our goal was twofold. First, we wanted to make fun lovin’, low stress, high impact wines that you could drink everyday without breaking the bank. Basket Case, first released with the 2004 vintage, is representative of our attitude-work hard, play hard, and have fun doing both-without raiding your retirement account. Our second goal was to make the best wine we knew how to make-Reversal Wines-a no holds barred approach to making wine that was unencumbered by cost, tradition, or style. These wines were to be reflections of our ideas of the perfect wine. Starting with the 2006 vintage, we launched a Chenin Blanc and Rose under our Shy Chenin label. The inspiration for this label was thirty-something years in the making. Chenin's parents planted a Chenin Blanc vineyard while her mom was pregnant with her, so they named her after the vineyard, and ever since, she has been a dedicated Chenin Blanc fan. This label is our tribute to her, as well as our way of making fun wines that are as true to the grape expression as we can get. Also that year, we released our first red wine under our no expense spared lineage...Reversal. From the start, we wanted to name this wine for a different way of thinking. We wanted to emphasize fabulous, value oriented wines that were meant to be enjoyed. We hope you enjoy our wines, and we hope you enjoy them in a snobbery free environment. Remember, drink what you like!! !